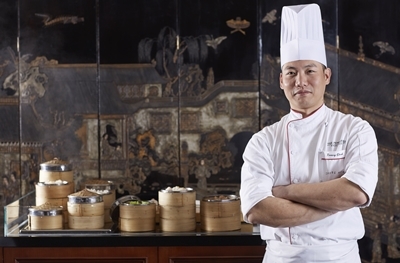 The Peninsula Hong Kong’s one-Michelin-starred Cantonese fine-dining restaurant, Spring Moon, has strengthened its culinary team with the appointment of Dim Sum Sous Chef Kanny Cheuk. Under the guidance of Chinese Cuisine Executive Chef Gordon Leung, Chef Cheuk has created a sumptuous collection of assorted dim sum for guests of Spring Moon to savour. Born in Hong Kong into a family that cherishes the Chaozhou traditions of hard work and perseverance, Chef Cheuk is single-minded in his endeavours to create ever-better dim sum, a level of dedication that has previously seen him win plaudits as one of the best young talents in his field. With more than 20 years of experience, Chef Cheuk says he is always thinking of ways to take Spring Moon’s dim sum to the next level, and as such, he holds himself and his team to incredibly high standards. These beliefs are best exemplified by the way he prepares his unique delicacies. To make his Steamed scallop dumplings with guava and shrimps, for example, Chef Cheuk simmers pears in guava juice and mixes in pomegranate juice when preparing the dumpling skin to give it a photogenic pink appearance, in addition to a refreshing taste. Another new creation is Chilled coconut and papaya with strawberry pudding and bird’s nest, in which he uses gongcai or “tribute vegetable” to give the dessert a novel twist. He also balances the freshness of papaya, the acidity of strawberries and the light bitterness and citrus kick of golden pomelo – to give the colourful dish a complex yet harmonious flavour. 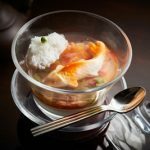 The dessert is topped off with a koi fish design, a traditional symbol of success and good fortune in China, and a reminder of Chef Cheuk’s desire to challenge diners to think about the individual ingredients and their place in Chinese culture. Steamed rice rolls hold a particularly special place in Chef Cheuk’s heart as he believes that preparing a simple dish such as this requires a great deal of effort and skill. Chef Cheuk’s signature rice rolls include Hungarian Mangalica barbecued pork, scallops and vegetables; or assorted fungus. With these delectable morsels, Chef Cheuk aims to bring back the traditional flavour of rice rolls, making them soft, silky and semi-transparent, with a skin that is thin, yet retains its chewiness.